It’s amazing how thoroughly the races of Azeroth are described! We would not have enough guts to retell everything the authors of the World of Warcraft universe came up with. Therefore, the Mantid, the great empire of praying mantis, we’ll describe in brief — just enough for you to follow the events, which took place in Pandaria. We’ll turn to them in our next stories. When the Old God Yogg-Saron sent The Curse of Flesh on the races of Azeroth, there was a war between the trolls of Zandalar and the insect empire Azj’Aqir in the southern part of Kalimdor. Buzzing, flying and creeping, the Aqir occupied The Dread Wastes on which the Kypari trees were growing. 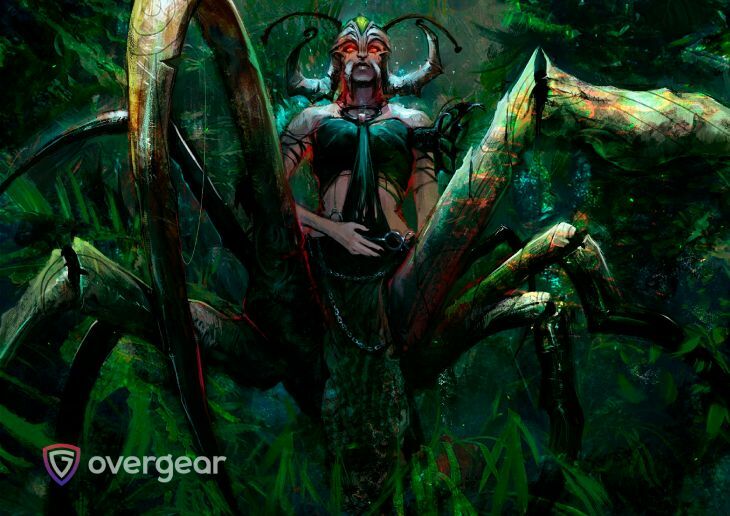 Thanks to them and the amber that they singled out, the Aqir evolved into the Mantid, powerful and formidable mantises. Their body was covered with a shell and some could fly. In general, the Mantid were better adapted to life than many other races of the southern part of Kalimdor. The Empress was the head of the mantis empire. She alone owned the right to give offspring. So, every hundred years there was a new generation. The newborn mantis was ruled by two instincts: to kill and to eat. Like the ancient Spartans, they dealt with weak brothers and sisters, and then devoured them cold-bloodedly. This “cleansing” was the first stage of their natural selection. In general, the ideology of the Mantid consisted in serving the Old God Y’Shaarj. They believed that one day he would return to his physical state, and then would need a strong army to enslave Azeroth. Therefore, the mantises were born to be warriors, before which all living would tremble. After the first selection stage, huge hordes of the strongest young mantises flew to the east and destroyed everything they encountered on the way. Their raids were cyclical and predictable, so the other races prepared in advance for the upcoming clashes. However, the losses have always been terrifying on both sides. Surviving mantises returned to the canopy of Kypari trees as adult strong warriors. Thus, the core of the Mantid empire, tempered in battle, was formed. The main enemies of the Mantid were the Lei Shen dynasty. But we have already told about them in the previous story. And about the relationship and the clashes between these races — we’ll tell in the following.